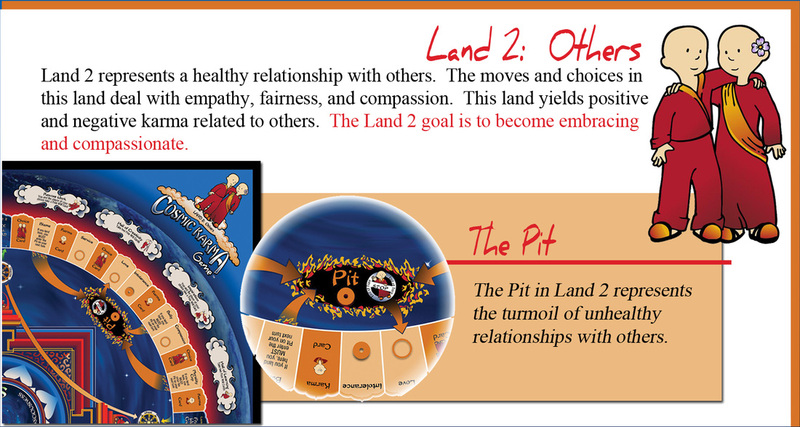 The Earth Realm is the player's home while he is in physical body. 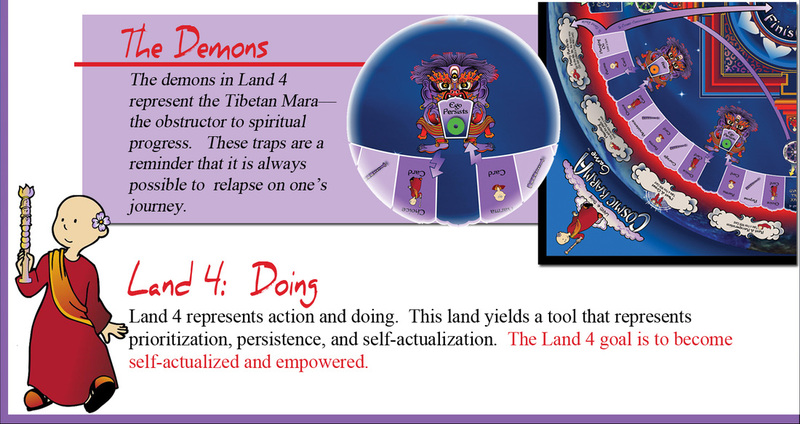 This realm represents a condition of duality where polarities such as good and bad exist. Here the player travels between physical lives. The experiences of this realm happen while the player is out of his physical body. This is both the starting and ending point of the game. It represents the concepts of the unknown, the unknowable, the All, source, and universal energy. Rings represent positive karma choices of: balance, sobriety, and maturity (green rings); respect, generosity, and inclusiveness (orange rings). Beads represent negative karma choices of: impatience, self-absorption, and denial (green beads); choices of anger, bullying, and blame (orange beads). When the player receives three beads of the same color they represent habitual thought in the form of a bad habit. Habits are more difficult to neutralize than beads. Torches represent receptivity. 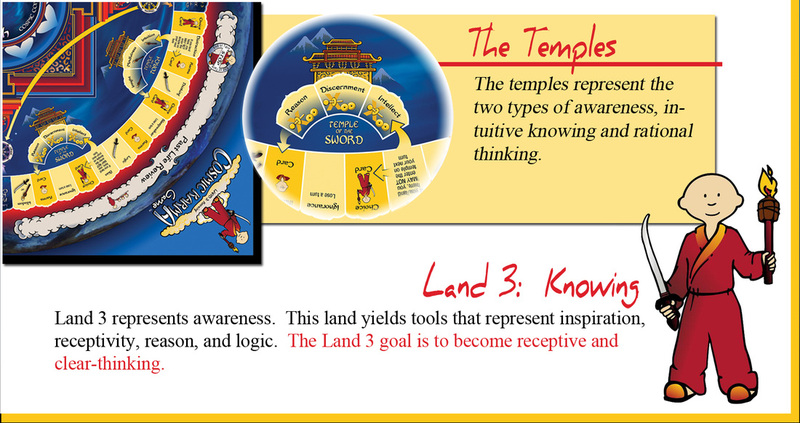 The power of the Master Torch is the power of intuitively know the best option on a Choice Card. Swords represent rational thinking. The power of the Master Sword is to loosen a habit. Wands represent skilled action. The power of the Master Wand is to enter the board's Dharma Wheels. Choice Cards reflect the duality of the Earth Realm. 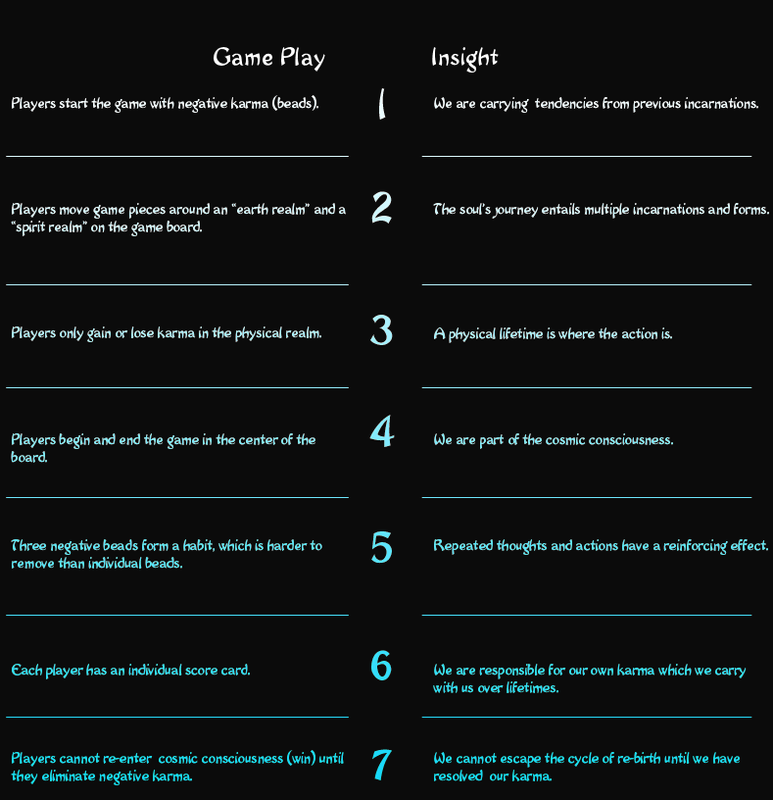 Each card presents two scenarios that the player chooses from. Most scenarios are ordinary situations and make the point that Karma is small. Karma Cards represent the complexity of karma. They are the wild cards of the game. They might provide an extra turn, interaction with another player, travel to another land, or some other unexpected outcome. They might even yield both good and bad outcomes in the same card. These represent the player's possession of free will. Each card has a number on it which may be played instead of throwing the dice. These cards may be played individually or in combination resulting in innumerable options.